As the Apollo program wound down in the late 60’s, NASA began to think about how it could reuse some of the technology and systems that had been developed for Apollo. This recycling effort was called the Apollo Applications Program. Apollo Applications led to Skylab, America’s first space station, but it was intended for the program to be more than just a one-shot. Skylab was to be followed by Skylab II , which would be more reusable and incorporate the first use of artificial gravity. 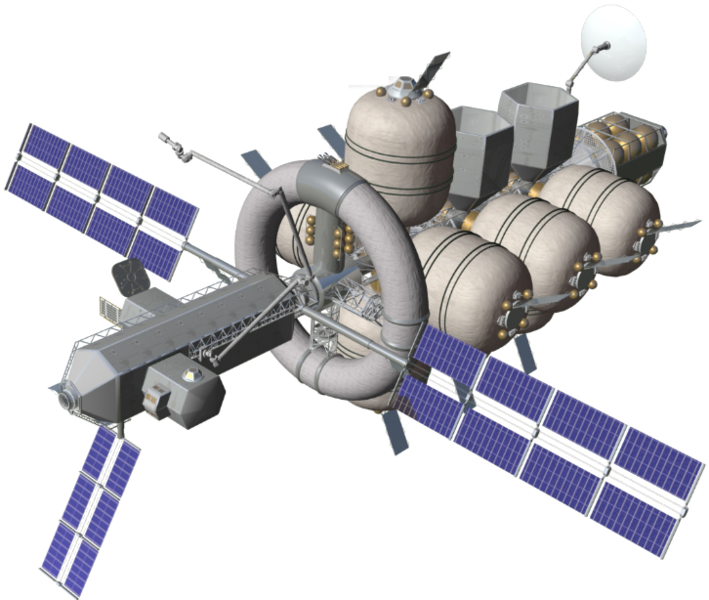 NASA hoped the Skylabs would lead to a 12-man space station and then a 50-man space base. There were also concepts for a lunar Skylab in polar orbit about the Moon. One by one, all of these concepts were dropped as NASA was forced to divert funding to its priority program – the development of the Space Shuttle. One of the more interesting concepts from this period did not come from NASA but from a model company called MPC. It may seem unusual for a realistic space-vehicle concept to come from a toy company, but it’s not too surprising given that the Pilgrim Observer was designed by the late G. Harry Stine. An aerospace engineer who learned his trade under Dr. Wernher von Braun launching V-2 rockets at White Sands, Harry Stine was one of the early advocates of commercial space and author of several books on space exploration and space development, including The Third Industrial Revolution. Although the Pilgrim Observer was not based directly on NASA concepts, Stine did incorporate much of the technology which he knew to be current at the time. The Pilgrim Observer was a reusable, nuclear-powered deep-space craft incorporating artificial gravity. For propulsion, it used the NERVA nuclear rocket engine which had already been tested-fired on the ground. The design included an Apollo taxi vehicle, with a shortened service module, and multiple telescopes and antennas for studying science targets. The Pilgrim Observer was not designed to land on a planet, but given sufficient propellant, it could carry out missions anywhere in the inner solar system. (The propellant tanks that come with the kit seem a bit small for the missions contemplated.) One possible mission was a Mars rendezvous with a Venus flyby en route. An asteroid rendezvous was another possible mission. Stine was already aware that the asteroids might be rich source of resources, and a plastic asteroid was included with the kit. The craft was sized for a crew of 12. 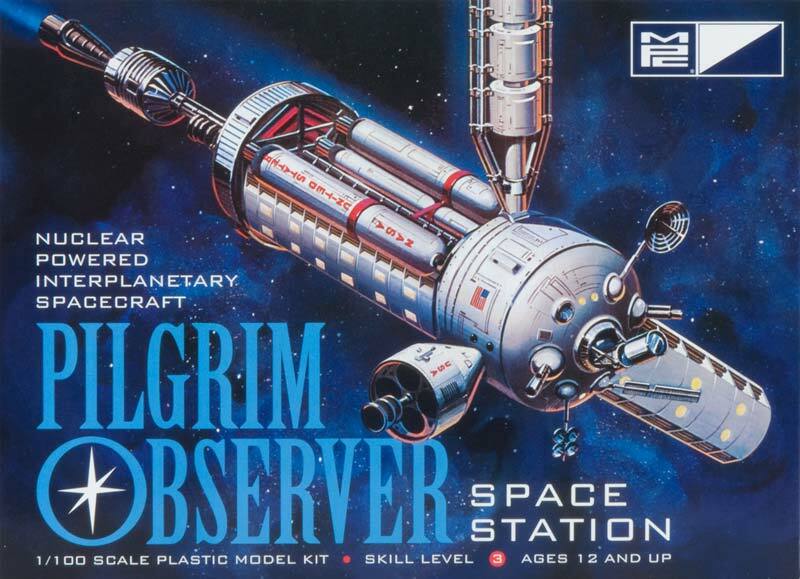 The Pilgrim Observer model kit was out of production for many years and, for a while, quite expensive as it was greatly sought after by collectors. Recently, the kit has been brought back into production by Round 2 Models. The idea of a dedicated deep-space exploration vehicle has made a comeback also. In 2011, NASA’s Technology Applications Assessment Team produced a concept called Nautilus-X. Nautilus-X shows many notable similarities in mission and design philosophy to Pilgrim Observer. Like the Pilgrim Observer, it incorporates rotating elements for artificial gravity. This is even more important today than it appeared in the 60’s and early 70’s. At that time, the deleterious effects of long-term exposure to weightlessness were merely suspected. Today, they are well known. Also like the Pilgrim Observer, Nautilus-X makes maximum use of existing systems and technology. The design incorporates modules that have been flown and tested aboard the International Space Station, as well as inflatable modules now being developed by Bigelow Aerospace for its future space station. It also includes a robotic arm, life-support systems, and solar arrays derived from ISS hardware. Nautilus-X is designed for a crew of six astronauts, only half as many as Pilgrim Observer. With modern computers and automation, however, the Nautilus-X crew might accomplish more than a larger crew would have in the 1970’s. Like Pilgrim Observer, Nautilus-X would have a hydroponic garden to grow its own food on long-duration missions. One noticeable difference between the two concepts is the use of nuclear power. Pilgrim Observer had a NERVA rocket engine and a separate nuclear reactor for electrical power. Nautilus-X has neither. This reflects the modern reality. Launching reactors that contain large amounts of nuclear fuel is not considered politically acceptable in today’s environment. Nuclear propulsion is still desirable for deep-space missions, but its use will likely have to wait until we discover a source of uranium or other nuclear fuel on the Moon or another celestial body. (Fortunately, based on what we know of lunar geology, that idea is not so far-fetched.) Until then, spacecraft like Nautilus-X will rely on solar-electric propulsion systems. Nautilus-X would be capable of carrying out missions from one month to 24 months in duration. Initial voyages would be confined to cis-lunar space until the vessel is proven. After that, it could undertake longer missions to the asteroids or Mars. Because the Nautilus-X design relies so heavily on off-the-shelf technology, the Technology Application Assessment Team concluded it could be developed in just over five years (64 months, to be exact) for a relatively modest investment of $3.7 billion. If development started in March 2012, Nautilus-X could be ready for its first shakedown cruise in July, 2017. The baseline plan calls for Nautilus-X to be launched by the Space Launch System (still on the drawing boards) and use the Orion Multi-Purpose Crew Vehicle as a taxi vehicle. Neither SLS nor Orion are expected to be ready for such ambitious missions until after 2020, however. An alternative would be to use existing rockets such as Atlas, Delta, or Falcon for launch and a commercial capsule such as Boeing’s CST-100 or SpaceX’s Dragon as the space taxi. At the moment, Nautilus-X remains a paper study. The Senate has directed NASA to spend tens of billions developing the SLS and Orion. That expense is likely to preclude NASA from starting work on innovative new programs like Nautilus-X. History seems to be repeating itself. Just as Shuttle development meant the end of Skylab B and lunar-orbiting stations, SLS development is likely to mean the end of Nautilus-X, at least as a NASA project. SpaceX founder Elon Musk is known to have ambitious long-term plans for Mars. Perhaps he will someday pick up the Nautilus ball which NASA dropped? Possible typo – March 2001 ? This is a great website. I found it while looking for article on The Pilgrim Observer. I’ll be coming back frequently, there is a lot of info to go over. Well, Whats the problem with the Government coming up with the necessary money? I am sick of Private Sectors paying for the Gov. I am retired Military and wish to the Lord sometimes that I had not have even voted this year, darned if you or don’t. Pick the ball back up and try again. It will work. I think you’ve misunderstood Nautilus-X somewhat. It’s meant to be launched in part by SLS because it needs to be, that initial core is 6.5m by 14m, it needs a HLV for both payload fairing and mass reasons. The conops of the spacecraft is to operate from L1 so it also needs a SLS launched Orion as a taxi to take crew out there, you can’t just replace it with an LEO only capsule launched by something that can’t send it to L1. Propulsion wise it’s also meant to be modular with swappable units so it’s entirely capable of having a NEP or NTR if the mission requires it, although only an NTR stage is in current development. Nautilus-X is a design exercise in SLS enabled deep space spacecraft, suggesting you could have it without a HLV is like saying you could afford to go to Disneyland if you didn’t have to pay the transportation costs to get there. There’s no law of physics that requires the core to be launched in one piece. The International Space Station wasn’t launched in one piece. Orbital rendezvous and docking are well-known techniques, which were demonstrated during the Gemini program nearly 50 years ago. I’d seen the Pilgrim Explorer before (MPC made many interesting kits), and I like much of stine’s work. I’ve come to dislike thinking on designs which use Shuttle-legacy components. That bird should never have been our primary lauhcn capability, it shouldn’t have become the majority lifting capabity of the ISS. Really the Russian way was better, but the Skylab method should be used. Even with small unmanned boosters, it yields as good a station, much cheaper and more quickly. Too bad it didn’t guarantee 40+ flights to Shuttle’s manifest. During the ’70s and ’80s, but for political decisions, we could have been flying Post-Saturn Nova boosters like Boeing’s giant AMLLV. During the ’90s, something like their ’76 SSTO SHLV SPS ferrys (a giant cargo version of the Kankoh Maru). Still an option, and arguably a better one than trying anything ambitious while still thinking of Shuttle-era methods. As for OTS, why not the Shuttle-C “Side-Mount” approach first? No reason since the late-70s for it not to have been flown and used as the backbone of our lift capability, even if not for people (as the entire Shuttle system should have been, except for USAF flights, as long as we’re using solids). Move beyond Shuttle-C while exploring re-designing the ET for top loads, while developing things like the HL-20 and 3-mode NTR.